SEPTEMBER 2008 -- Our second annual “Let’s Celebrate Day!” was held on July 26th at Good Will Grange Hall. The judging of all of the CWA contests, the photo contest and the Publicity Poster Contest were held and the entries placed on display. A delicious lunch was provided by the Junior Director, Joan Perry and her crew, which helped to fatten their treasury! The judging was followed by a wonderful program arranged by our State Lecturer, Marge Bernhardt. The CWA theme, “The Melody Lingers On” was carried out with the music of the Bristol Old Tyme Fiddlers, which was enjoyed by all who attended. The winners in each of the contests were announced followed by refreshments. Our thanks to everyone who helped to make the day a success. 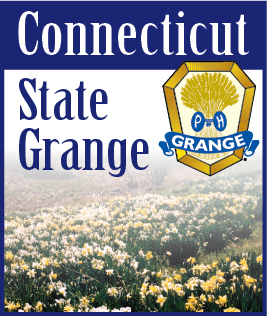 The 1st place winners of the New England Needlework Contest will represent CT at the New England Judging to be held on Friday, Sept. 12th at the Big E. We wish all our contestants “Good Luck” and hope many of you will go to see the display in the New England Grange Building. Our thanks to all who supported our CWA contests and hope you will enter again next year.